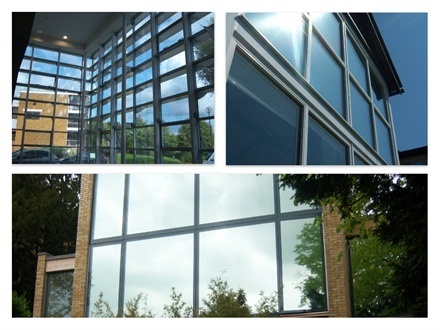 An application of solar control window film provides an effective solution to a range of glass related issues. Heat, glare and fading can all be reduced, with a product suitable for every situation, including commercial and residential environments. Solar control window film is available in a range of grades and finishes, providing a choice of performance and aesthetic qualities. Once installed, the film is easy to maintain, allowing you to relax and enjoy the benefits as soon as it is in place. For a guaranteed high quality application, we offer a nationwide installation service, whilst our solar films are also available to purchase online for DIY installation. Medium Reflective Silver window film offers excellent solar heat and glare protection without substantially reducing incoming light. This film will provide your glazing with a modern, mirrored appearance. Light Reflective Silver window film can reduce heat and glare whilst having a minimal effect on the appearance of your glass. Light Reflective Silver is also ahighly effective way of filtering UV rays, this film can lock out up to 95% of UV. Climate 50 Window Film is a solar control film which offers protection from heat build up and glare, as well as blocking up to 99% of UV rays. The nature of the film means that natural light levels aren't affected, providing excellent performance without sacrificing light. Climate 70 window film is a solar control film which offers outstanding solar and UV protection without sacrificing incoming natural light. The film blocks out up to 99% of harmful UV rays, making it an effective barrier to fading. External reflective solar window film that is a high performing solar control film specifically designed for external application. This film provides excellent heat and glare reduction and will give your glazing a modern, mirrored finish. It can also be used for daytime one-way privacy. High Reflective Gold Window Film is a high performing solar control film for heat and glare which gives a stylish gold appearance to glazing. The film reduces levels of heat and glare, making living and working conditions more confortable. High Reflective Green Window Film is a high performing solar control film for heat and glare which gives a uniform green appearance to glazing. The film reduces levels of heat and glare, making living and working conditions more confortable. Commercial Solar Control Window Film can be used to solve a range of problems. Long lasting and durable, window film is a cost efficient and effective way of avoiding costly replacement windows and glass. Heat can be an issue for any property with outward facing windows. With the sunlight streaming through the glass, temperatures can quickly become uncomfortable. Solar control window film will prevent this steady heat build up, resulting in a more stable, moderate temperature. The film reflects away the suns energy before it enters the room, making it a more effective solution than traditional methods like blinds, which allow the heat to enter the room. Energy efficiency remains high on the agenda for businesses, with environmental pressures and rising energy costs making improved energy efficiency an ongoing requirement. By reducing excess heat levels, solar window film can help reduce the strain on air conditioning units, reducing in lower running costs. Glare can be a year round issue, with the bright sunshine of sumer and the low lying position of the sun during winter months, making it difficult to focus on screens, equipments or colleagues. An application of solar control window film will cut down on the glare, whilst maintinaing the view and without sacrificing too much natural light. Residential Solar Control Window Film is suitable for use in a number of domestic applications. With a range of finishes to choose from, there is a film available to match both function and aesthetic requirements. Heat is a common problem in the home and an application of solar protection film is a cost efective and straightforward solution. The film works by relfelcting away the suns energy before it enters the room, stopping your home from getting steadily hotter. By not allowing the excess heat to enter the room, window film performs far more effectively than blinds. The film is available in a range of different finishes, meaning there is a film that will suit the style of your property, whilst the film will not obstruct vision, or have a major impact on the light entering the room; another improvement on traditional methods such as blinds. Glare caused by sunlight streaming through your windows can be a major problem. By adding solar protection window film to your glass, it is possible to instantly cut down the glare, making it posible to comfrotably watch TV or read, whatever the weather. Fading is a result of heat, light and UV rays, and an application of solar control film provides an effective barrier against all three. By cutting out up to 99% of the suns harmful UV rays, solar control film protects furnishings, belongings and carpets from fading, whilst also serving to protect skin from sun damage - our range of films have an equivalent SPF of 285. DIY Solar Commercial Window Film is available to purchase from our online store, with product information and video fitting instructions available for each film. We also offer a nation-wide fitting service for both residential and commercial customers who would like a professional installation. For ore information about this service or a quote for fitting the film you purchase, contact one of our team on 01494 794477.